Star Trek: Generations (1994) Dr. David Carson | Cappa Toons! So begins the feature film debut of the Star Trek: The Next Generation crew. Much like Star Trek: The Motion Picture, things are already off to a wobbly start. I find this movie to be frustrating because it has a lot of good things going for it, some of it is just mediocre, and some things about it are down right awful. One of the problems I have with Generations is that it seems to have some trouble transitioning from television to feature film. There are aspects of it that feel like a TV subplot, especially the storyline concerning Data, which doesn’t contribute in any way to the rest of the film. As far as villains go, while I’m a fan of the two Klingons of the Duras family, Lursa and B’etor, I never found them to be particularly memorable in this film. In fact, after watching it just now, I completely forgot they were in the movie, which goes to show how much their contribution to the story meant. The film starts out promising enough as we transition from the disaster of the Enterprise B to the TNG crew. Captain Kirk’s interactions with Chekov and Scotty are fun with some well written banter. I would even argue that the opening sequence is probably the best part of the film because we are already accustomed to the TOS crew, and there is still great chemistry between the old Star Trek leads. It also does a good job as a compelling set up. The rest of the movie however disappoints, and never quite manages to establish all the TNG characters as feature film players to really make this movie their own. The first thing I need to get out of the way is what I consider the worst part of Generations: Data. 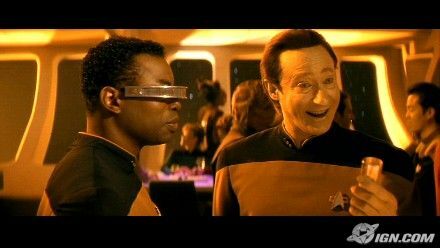 I’ve always liked Data in the series, but he is seriously annoying in this film and not in the way he was intended to be. His story in this film really opens a hole for me in the idea of why Data desires to be human and doesn’t embrace his machine side. People are always arguing to Data why he would chose to be less than what his machine parts make him capable of…such as intense concentration, his super-intelligence, willingness to learn, not to mention super strength. He is the anti-Spock, where Spock chose to embrace his Vulcan side over his human half which he constantly struggled to deal with. Why does Data want to be human? Why does he assume that human emotion has all the desired answers to the universe? Speaking as a human, I have always embraced my passionate, emotional side, but it is not the end all be all answer to what lies beyond it. Sometimes I think Data’s problem is that he doesn’t appreciate his own diversity. He is alone, being the only android of his kind. But he is also unique in that he can establish for himself how he wants to conduct himself as a single life form. He is capable of so much more, and yet as everyone says, he desire is to be less than what he is fully functionally capable of. It may be more of a curse than an asset that his creator embedded his programming with the desire to be human. His desire to be human limits him to an extent. If Data chose to ignore his humanity program, that doesn’t entirely mean he would suddenly go to the dark side and be cold and calculating. He has much he can learn from humanity, but he shouldn’t need to embrace it. I have noticed a few times in the series when Datas machine side has taken over, he doesn’t know how to control it, and he winds up doing frightening things. His attention has been so focused his “humanity”…on being something he’s not, that he loses focus on his own instincts as a machine. So I couldn’t help but watch in Generations that somehow, when Data puts the emotion chip in, he’s unintentionally taking a step backwards. He feels the need for it because he thinks he’s exceeded his capacity as a machine. But has he? The emotion chip seems to constantly distract him and makes him function inadequately as a machine. As for all the attempts to show Data as being not funny to the rest of the crew, it succeeds all to well on the audience too, because Data is not funny. He’s annoying and quite frankly embarrassing to watch. From a storytelling perspective alone, if they couldn’t succeed to make Data a compelling character in his struggle to understand humanity, that means there’s something wrong with the story. Like a bad episode of the TV series, this tells me that this was a path Data was not meant to go, because the audience reaction is generally resistant to all of his actions. It is in my opinion a step backwards for the character, and it’s the one thing that really brings this movie down and keeps me from wanting to revisit it. Less annoying, but never that engaging is Picard dealing with the death of his brother Robert and his nephew Rene in a fire, only to discover he has no heir to his family. I found Picard’s story to be somewhat frustrating in that there’s nothing he really learns from the adventure to help him deal, except what he moralizes about Time at the end of the film. Picard’s personal problems never impact his judgement as captain, and don’t contribute anything to the rest of the story. It’s only in the Nexxus where he’s simply given the opportunity to let it go. But the problem here is that the resolution happens too soon and leaves nothing for the death of Kirk, which doesn’t have any impact on Picard. Unlike the Wrath of Khan, Spock’s death tied into Kirks own fear of aging, and the scene was powerful because it meant something to both Spock and Kirk. 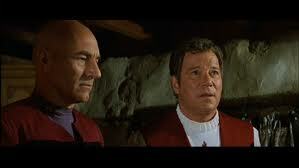 Picard and Kirk in this film never develop much of a relationship. Picard doesn’t really know him apart from what he’s read in history books, and the film struggles to generate some meaning of Kirk’s death. But really, since Kirk is out of his time away from everything he knows, he gets the one thing he’s always known he’s had coming: he dies alone. I know the creators probably want to forget Star Trek V, but this is the one thing Kirk acknowledged about himself, and if he were to die alone, this could have been brought back in some way to make the scene more powerful. As it stands, his death scene is more disappointing than anything, and it would have been nicer if he could have been proven wrong in some way. Apart from the two main story lines, the rest of the Enterprise crew just isn’t given enough to do. The villains are also particularly weak. While Malcolm McDowell is a great actor, his character Dr. Soren just isn’t that menacing. I remember Soren’s particular species made an appearence on DS9 (played by Chris Sarandon) in that they were “listeners”, but that ability is never put to any use, and his emotional side is never really explored. There’s some interesting backstory about the Borg destroying Soren’s homeworld, and Picard tries to tie that in with the fact that his plan to enter bliss (i.e. The Nexxus) means the genocide of millions on a planet. We never understand enough about Soren’s pain to be frightened of him or make him a compelling threat. And like I said about the Klingon women, Lursa and B’etor, they are completely forgettable as villains in this movie. The other thing I noticed is that the opening sequence with Kirk, Chekov, and Scotty seems to last much longer than it should have, just to get the film started and then to send the TNG crew on their way. The actual adventures the TNG crew seem shorter in this movie since so much time is taken up with the opening and the lengthy time we spend in the Nexuss. 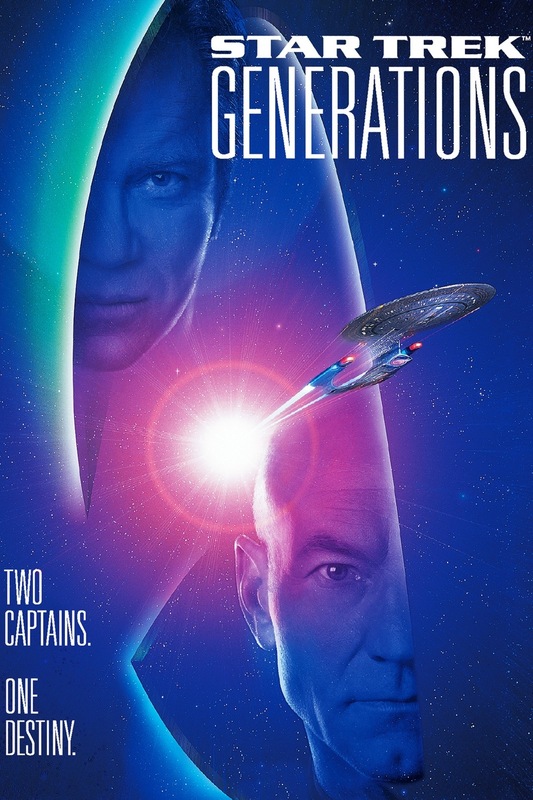 Star Trek: Generations is a troubling film. It’s mediocre at best, and often times I’ve found mediocre films to be worse than some movies that are just downright bad. The concept to bring the two captains together just isn’t well executed. There’s probably a better movie in there, but it just doesn’t compliment well with the rest of the series mythology.